David Goldman, a partner at Klee Woolf Goldman & Filpi, LLP, is a Suffolk county native and Longwood High School alumnus who obtained his BA in Political Science from the State University of New York College at Geneseo, where he was a member of the Pi Sigma Alpha Honor Society, and Juris Doctor from Hofstra University School of Law. While in law school, Davin was Editor-in-Chief of the Hofstra Conscience and was a member of Phi Alpha Delta Law Fraternity, the Public Justice Foundation and LALSA (Latin American Law Students Association). 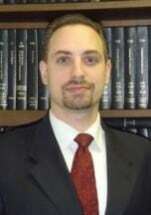 Davin has been with Klee Woolf Goldman & Filpi, LLP, since being admitted to the Bar in 2004. Davin is a member of the Nassau County Bar Association, New York State Trial Lawyers Association, Injured Workers' Bar Association. Klee Woolf Goldman & Filpi, LLP, serves clients in Mineola, New York, and counties in and around the New York City metro area.